Rio Tino Alcan Inc. Pledges US$2M To Agricultural Scholarships & Poverty Reduction! 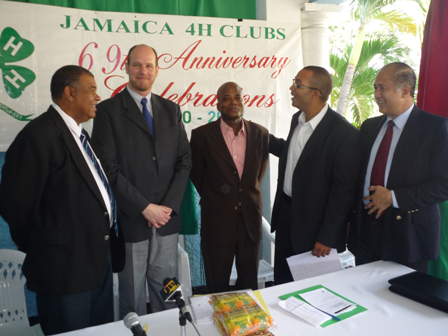 (News Releases, Kingston, January 7, 2010) – A Memorandum of Understanding between Rio Tinto Alcan Inc. and the Jamaica 4-H Clubs for the execution of an Agricultural Scholarship Programme was recently signed at the 4-H Clubs headquarters in Kingston. This commitment will be of great benefit to students pursuing agricultural studies at the secondary and tertiary levels in the parishes of St. Ann, St. Catherine and Manchester. Through the RTLAF which comprises two components – the Agricultural Sponsorship Programme (the AS) and a Loan Guarantee Fund (the LGF), US$2M has been contributed in support of the Jamaican Poverty Reduction Strategy Programme as well as the Government’s efforts to achieve Millennium Development Goals. “The Rio Tinto Alcan Jamaica Legacy Fund will be a self-sustaining fund that will continue to provide tangible benefits to the people of Jamaica for many years and support the Government of Jamaica’s Poverty Alleviation Strategy and development objectives by 1) supporting agricultural scholarships for disadvantaged youth and 2) supporting micro-finance loans to agri-business through the establishment of a loan guarantee fund,” Rio Tinto said in a statement. Rio Tinto added that in establishing the fund, they were fulfilling their commitment to the Government and people of Jamaica following the sale of their interest here. In 2001, Alcan ended 59 years of bauxite mining and alumina refining in Jamaica. The Jamaica 4-H Clubs, the youth training arm of the Ministry of Agriculture and Fisheries has been selected to manage the scholarship programme. Already, students from schools in the three parishes have been selected as beneficiaries. Selected schools include Jose Marti High, Marcus Garvey High, Ferncourt High, Holmwood Technical High, Sydney Pagan, Ebony Park Heart Academy, Knockalva Agricultural School, and Dinthill High. Beneficiaries at the University of the West Indies as well as the College of Agriculture, Science and Education, (CASE) are pending and will soon be involved in the pool of beneficiaries. Other secondary schools in St. Catherine are also pending. Executive Director of the Jamaica 4-H Clubs, Lenworth Fulton expressed his pleasure and gratitude at the agreement brokered with Rio Tinto. “This gesture shows the confidence that Rio Tinto Alcan has placed in us, and we are happy for this contribution. Not only will it go a long way in supporting needy students, but will also enhance the pursuit of agriculture as a viable career,” he said. Chairman of the Board of Directors of the Jamaica 4-H Clubs, Vindel Kerr, noted the level of investment in Jamaica by Rio Tinto. “In a time where the country is experiencing probably one of its worst economic recessions in modern history, a significant investment such as this cannot go unnoticed. It is not only an investment in Jamaica on the whole, but also an investment in our youth, particularly our rural youth,” he said. The Agricultural Scholarship Programme will be launched in January 2010, while the Rio Tinto Alcan Legacy Fund will be fully established in 2011. ← Small Business Not Keeping Up With Online Presence!